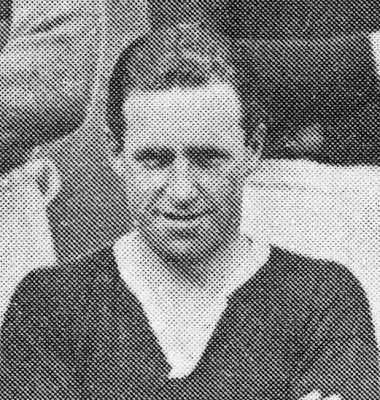 It is well recorded that Sydney Puddefoot signed for Falkirk in the 1920s after having wowed the fans when he was stationed in Scotland during the Great War. The Falkirk fans & the board put all other considerations aside to raise the £5,500 price tag which West Ham had put on him largely to deter Falkirk, it did not deter Falkirk FC. What is less well known is that during Syd's time at Falkirk his little brother also turned up: Leonard Puddefoot. Unlike Sydney I can find very little written about Len, either as a footballer or otherwise. I do not know why he played for the club, other than this one match I have never found any record of him playing football at any level whatsoever; Perhaps Syd convinced the board to give his brother a trial, perhaps it was part of Syd's contract. All I know is that Len is missing from the usual sources: he is not in John Listser's CD-Rom of Scottish Players' Registration; nor in Michael Joyce's Football League Players' Records 1888-1939. Which would suggest that his main football was with juvenile and non-league football in and around London. 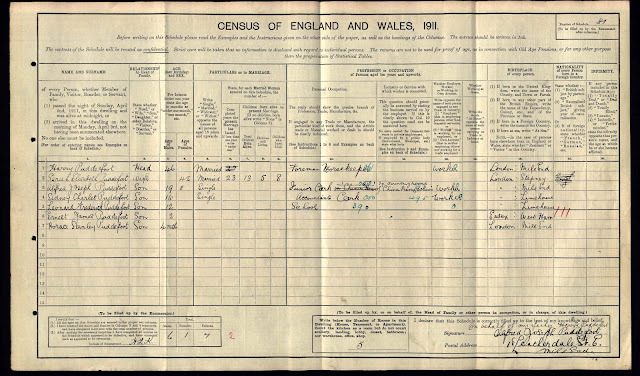 Whatever the case, I found the brothers in the 1911 census, I looked because even though Puddefoot is a very rare name, I had to look because I had very little to go on to be sure that this was another case of a pair of brothers playing for Falkirk FC. Never have been a big fan of collecting cigarette cards, for a start there were always too few Falkirk Players [never mind next to no ESFC players], and to get players once with Falkirk [or 'shire] now with some English team [no offence against the English, just none of you have ever won the Stirlingshire Cup!] seemed wrong. I would try to buy every player connected with Falkirk, but hey, I do have alcohol & tobacco to buy too!!! I do however monitor, in passing, the trade in cards on ebay etc, and occasionally will try to get a card of a Falkirk player if it seems reasonable, it was with this I came across a card of the legend that was Jock Simpson. 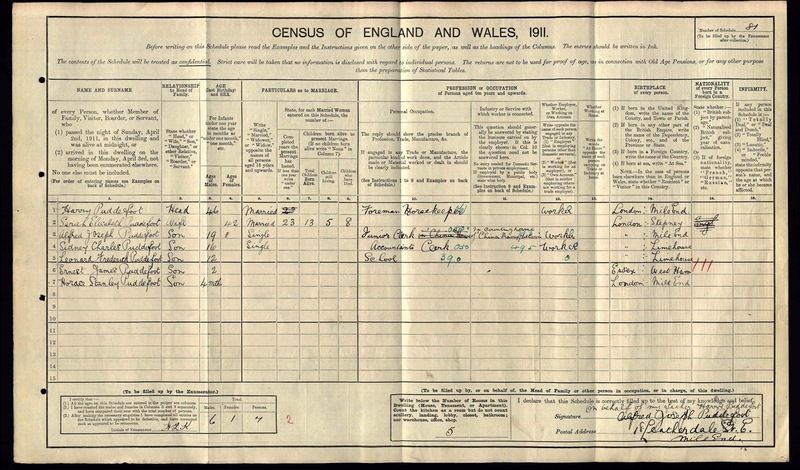 With Blackburn, and obviously dated from 1911 [whether later 1910/11 or early 1911/12 I can't say] but since he was born Christmas Day and joined Blackburn in January 1911, it just takes a bit of counting. I like this, because it gives me his height and weight which I never knew before, and keep records [when I can find them] on a different sheet. And this within a year of signing for Blackburn from Falkirk allows me to crowbar it into my notes. As it says, he was born in England, but was brought up just outside Falkirk, so couldn't play for Scotland by the rules of the day, and if I am correct in December 1910 became only the second person selected for an England Representative match whilst playing in Scotland after Henry Hammond who was selected whilst being a Master at Blairlodge and a player for East Stirlingshire in the 1890s. In December 1918, the West Ham Centre-Forward was posted North of the Border, the closest club to his station was Falkirk FC [he scored 14 goals in that half season], His name was Sydney Charles Puddefoot. With the resumtion of footballing normality, the Falkirk faithfull demanded a great Centre-Forward, but they didn't demand any great Centre-Forward, they wanted Puddefoot back. Falkirk made the initial enquiries, to which West Ham put up the ridiculous asking price of £5,500, Falkirk FC did not have that kind of Money, but the fans put it upon themselves to go for a public conscription. Needless to say the fans made up the difference and in Feb 1922 we broke the World Record for a transfer fee. He moved on to Blackburn Rovers, because the English FA was so pig-ignorant as to never select a player playing outside England which left him out of the National team, you can't really blame him for moving.